Coolant reroute @ 949Racing - Miata Turbo Forum - Boost cars, acquire cats. As most of you know by now, M-tuned has just released the first to complete single exit coolant reroute system for the Miata. We're proud to carry the reroute and Corrado rotor conversion as well. This is not a heater bypass or a twin exit system. 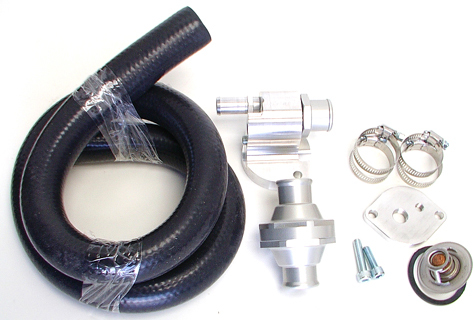 If you are considering adding forced induction to your Miata, consider this kit a must have. A bone stock first gen Miata with a 100% functional OEM cooling system at a 70mph cruise in 90° weather with the A/C on will kick the fans on and run over 210° coolant temps. That, dear friends, is woefully inadequate cooling. Add forced induction or take it to the track and you are taxing the system even more. Even if the car runs fine with 210°+ coolant temps, the factory ECU will add a bit of fuel which reduces power. The engine will always be the most efficient when there is the greatest temperature difference between combustion gasses and the cylinder head. So ideally, you want 180~190° temps which is what you'll get with a reroute and modest sizes radiator. A 160° tstat is optional for those that have programmable ECU's. Unless you are running a turbo on the track with A/C, you won't likely need a 55mm radiator once you have a reroute. A 37mm will be fine and non a/c- FMIC cars with sealed airflow and vented hoods can often get by with a lightweight 25mm core. Any idea if M-tuned will sell parts only? Im interested in the remote T-stat for my begi re route. I'll only be offering the complete kits. The instructions recommend a 50/50 antifreeze/water mix which is good for street use. For track use I recommend flushing the system before installing the reroute then filling with distilled water, about 3~4 oz. of anti-freeze and half a bottle of Redline Water Wetter. This mix will be not only run cooler, it won't make a mess on track should some of it escape the overflow tank. For those of you removing the heater or bypassing it, you will need to run a restriction in the 5/8" heater hose. Without the restrictor, too much hot coolant goes through the hose and right back to the water pump instead of being sent through the tstat and to the rad. That flow imbalance can cause the engine to run hot. A 3/4" long piece of 5/16" or 3/8" diameter fuel hose stuffed into the heater return line will do the trick.